77 +/- ACRES. 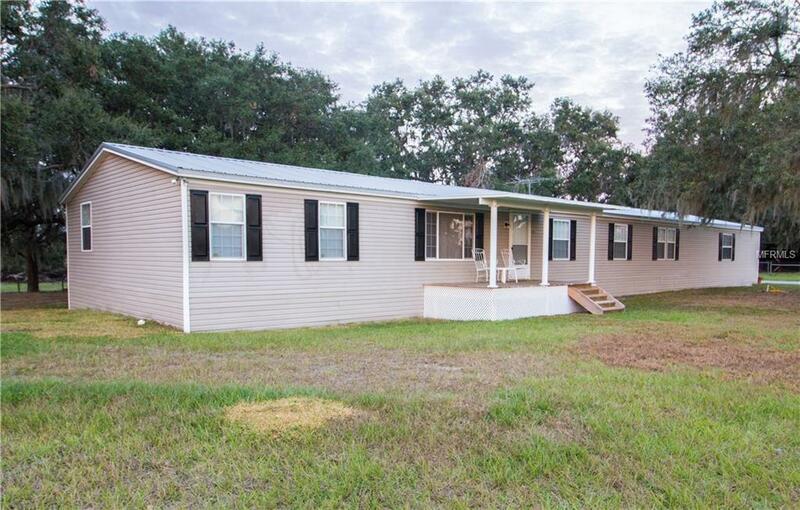 Experience country living with acreage, on this beautiful ranchette located on Peace Creek in Bartow, FL. Enjoy your own little slice of heaven where you can raise cattle, plant your agricultural roots and/or enjoy the picturesque property for recreational purposes. There are five wells on the property: one deep and four shallow. The deep well is 376 feet deep, 6" diameter, 105 feet of 6" casing in it. 63 feet of drop pipe. Deep well pumps 55 gallons per minute. The deep well is used for water for the home and irrigation. The mobile home, built in 2002 boasts a front & back porch from which you can enjoy the sunrise/sunset. New AC in 2014. Metal roof. Hurricane rated to withstand 150 mph winds. There are 3 bedrooms/2 baths. The Dining Room has a closet and could converted to a 4th bedroom. Over-sized attached garage: 30x30 or 900 feet. Well water with softener. Additional structures on the property include: 22x40 large hay barn, 20x20 small hay barn, tractor shed, squeeze shoot, with covered roof and cow pens. There is an easement to the property off of Highway 60 and Wingate Road. The property affords peace & quiet, but is conveniently located to shopping. Peace Creek Pasture is only 7 miles to downtown Bartow, 10 miles to the City of Lake Wales and 23 miles to downtown Lakeland. Click the virutal tour button to see drone video of property.